It’s fall here in Northern Michigan. The flowers in our garden are fading, the squash is ready to harvest and the Echinacea is ready to be dug up and preserved. As many of you know, Echinacea is an immune supporter. It can assist your body in warding off colds and flus and can help in recovery if you do come down with an illness. 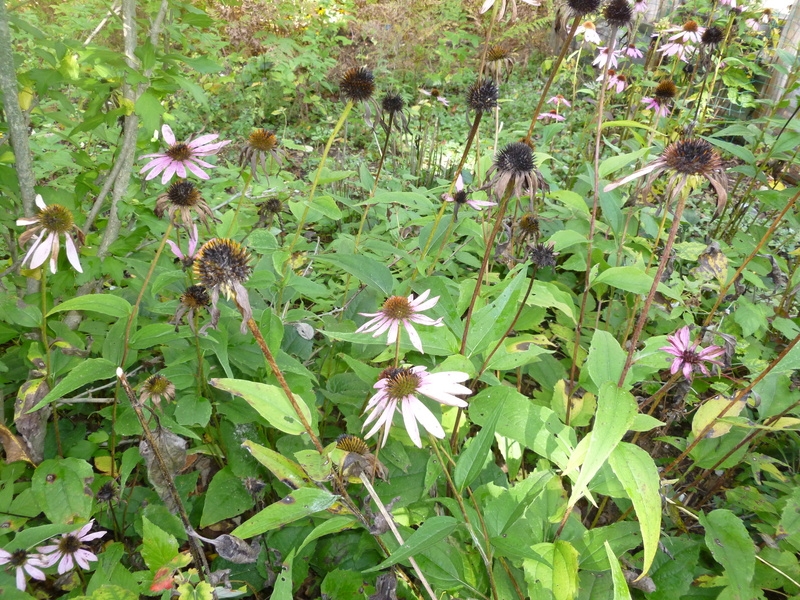 We have Echinacea all over our little stretch of the woods and this is the time of year we harvest the roots for tincture. It is best to harvest the plants when the flowers begin to die off and the stems begin to brown. The nutrients of the plant begin to receded back down into the roots, making them more potent. To harvest, you only need a few sections of the plant. A little goes a long way. Echinacea spreads wonderfully, so using a few plants for their roots shouldn’t deplete your supply, as long as you leave some plants in the ground. Our garden started out with only 2 plants and now we have close to 50. Each fall I will gently dig up 3 or 4 for their roots. After you dig up the plants, you can cut off the stem. You will only use the roots. Gently wash the roots. I run them under warm water and use a toothbrush to remove the dirt. Be sure to take the time to remove all of the dirt from the roots. Once all of the dirt is removed and the roots are clean, use a sharp knife to cut the root into small pieces. Fill an amber glass dropper bottle (I use a 4 oz. bottle) 1/4 to 1/2 full with the root. Pour 100 proof vodka into the dropper bottle until full. Let the tincture sit for at least one month in a cool, dry place before using. Shake the bottle daily during this time. If you choose, you can strain the root out using a funnel and cheesecloth, putting the liquid into a new, clean dropper bottle. To use, put a few drops directly under your tongue daily during cold and flu season. You can use up to 3 times a day when sick. You can also add a couple of drops to a cup of hot tea or juice. If you are opposed to the alcohol content within the tincture you can also dry the roots instead of steeping them in alcohol. Use a standard or solar dehydrator to dry them. (We got our dehydrator from www.dryit.com and we love it. You can also build your own.) Store the roots, once dried, in an air tight container, such as a mason jar. To use, steep a few small pieces of the root into some hot tea. I usually crush them a little too. I do this for our kids when they have a cold and usually add a little fresh ginger and honey. Most of what we grow in our garden is either edible or medicinal and out of all of the plants we grow, Echinacea is one of our favorites.